Mozilla has released a security update for Firefox 3.5.3. Make sure you install it as soon as you can. Plus, Firefox 3.5.3 checks your current Adobe Flash Plugin version that will show you if it needs to be updated. With Firefox 3.6, you would be able to go a Plugin status page and see which of your installed plugins need updating. Adsense Monitor: Another add-on that lets you monitor you adsense earnings right in your Firefox status bar updated in near real-time. Supports common reporting time periods, custom update frequency, Scrolling notifier or static view, customizable actions for mouse clicks, secure local password management. Looks like a very promising add-on. FoxyRank: This experimental add-on can interpret robots.txt and shows you all the links of the current webpage that can inherit pagerank juice to the linked pages. It also shows links that are not locked by robots.txt, nofollow metatag or attribute and helps you optimize your website. It also shows current Pagerank of the website. Social Media: Experimental add-on that shows the number of Diggs, Reditt Votes, Stumble Thumbs, Reviews, Delicious tags, Tweets, Tip’d votes etc in one place for any webpage you visit giving you a quick view on how a page is performing on various social media sites. You can also become the first one to submit if the page isn’t already in one of these sites boosting your social media profile. Adsense Preview: Lets you preview Google Ads that may show on any web page. You can visually test out various ad placements by choosing the wanted ad sizes from a toolbar menu. WOT: This add-on is a must have for bloggers and everyone else alike. Web of trust warns your about risky websites that tries to scam visitors, deliver malware, spam, etc. Using Firefox in itself has made your computer safer. WOT just takes that safety to another level. Facebook Purity removes all messages posted by applications to your homepage. It gets rid of messages about quizzes, etc leaving clean updates like status updates, wall posts, links, photos, etc. The script also comes with a whitelist variable where you can specifically allow certain applications you want to be allowed. Enjoy a cleaner Facebook experience. 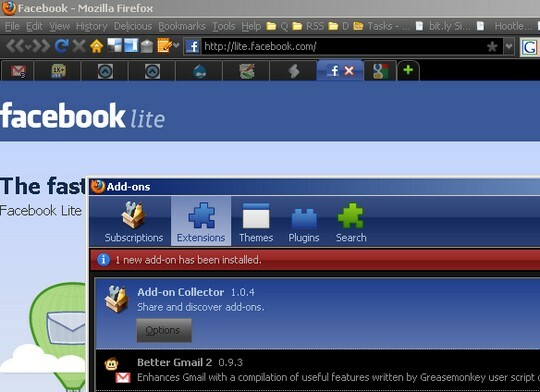 You can find out about Greasemonkey Firefox extension here. I came across Stratini theme in Firefox Facts and thought I’d give it a try. It is a compact theme based on Strata best suited for notebooks and netbooks. Don’t forget to check out our collection of Top Firefox Extensions categorized so you can find the add-on you need easily.